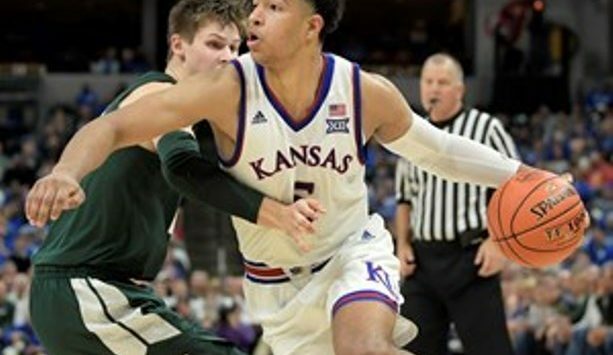 LAWRENCE, Kan. – Kansas men’s basketball guard Quentin Grimes has declared for the NBA Draft, KU head coach Bill Self confirmed Wednesday. Grimes announced he would be going into the NBA Draft via twitter. As a freshman, Grimes started every game in 2018-19 and averaged 8.4 points and 2.5 rebounds per game. The 6-foot-5, 210-pound, guard from The Woodlands, Texas, had a solid Big 12 Championship where he averaged 13.3 points, 4.3 rebounds, 2.3 assists and 2.0 steals with six 3-pointers made in ku three contests. Grimes finished second on the team with 54 3-pointers made and had 13 games with 10 or more points. He scored a season-high 21 points in KU’s season-opening win against Michigan State in the Champions Classic, in which he was later named the Big 12 Newcomer of the Week. Grimes is the fourth member of the 2018-19 roster that will not be returning next season. Guards Charlie Moore and K.J. Lawson have announced their intentions to transfer and forward Dedric Lawson declared for the NBA Draft on April 8.